From the kitchen One Perfect Bite...As babies, my children ate orange vegetables with such abandon that they occasionally radiated a jaundiced glow. We didn't have that problem as they became older. The carrots and sweet potatoes they loved as infants became a hard-sell at the dinner table. I couldn't understand it. I happen to love carrots, but then I'm also a beet lover, so, I'm probably a poor barometer of public taste and vegetable consumption. I set out to find or create recipes for vegetables that were so appealing that they couldn't be refused. I found today's recipe, which comes from New York Magazine, while on a quest to add color to our Easter table. I traditionally make lamb on Easter Sunday. While working through the various options at my disposal, I decided to give this recipe a try. I'm so glad I did. These carrots are flavored with the spices of Morocco, and they pair wonderfully well with lamb or any plain roasted meat. The carrots, which are very easy to prepare, should be refrigerated for at least 8 hours, but be sure to serve them at room temperature. 1) Place carrots in a large pot of cold water and bring to a boil, cooking until slightly tender but not overdone, approximately 15 minutes depending on size of carrots. Drain and place carrots in cold water until cool. Slice diagonally into 1/4-inch thick rounds. 2) In a large skillet, sauté carrot slices in olive oil until slightly brown, cooking them in small batches if your pan becomes crowded. 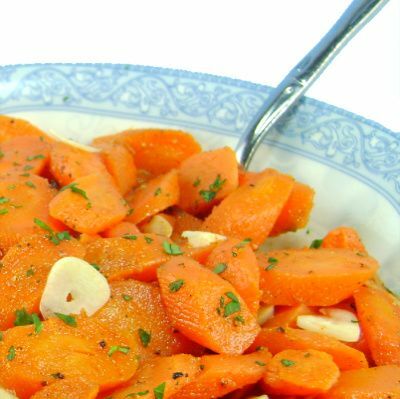 3) Place carrots in a bowl, add olive oil and remaining ingredients, and mix well. For best results, refrigerate overnight and serve at room temperature. Yield: 5 servings. I will give you another idea since you said your children like orange. slice your carrot, add fresh orange juice and boil them for couple minutes to slightly tender, add a dab of butter fresh cilantro and garlic and saute.. Serve and remember me. Arlette, thank you. I promise to remember you :-). My middle daughter turned orange from eating so many carrots when she was a baby :) She never grew out of it though and still loves them today! I actually thought of cooking some carrots and peas for the dinner...but got distracted by a movie and ended up eating some bread. I am very sure that I will love this carrot dish as it contains so many spices that I love, esp. the cumin! Great click too! That looks lovely. Carrots, cumin, garlic, cayenne,... oh yum! I absolutely adore carrots, prepared in almost any form, and will definitely be bookmarking this recipe. Thanks! And I thought my kids were the only ones that "forgot" that they used to love a food! I'll give these a try if it will make my boys touch a vegetable! I love carrots made this way! Mmm, I love the spicing in them. My daughter turned orange as an infant too.. she loved her carrots and sweet potatoes! I have never seen this recipe with the pan frying step and O yum! that has upped the delicious meter! I love visiting your blog because there are always interesting recipes to try out. I have made these for a side dish around holiday time and its a hit...I do mine a little different and add some brown sugar. These look amazing! I love carrots and beets too! This recipe sounds delicious. I love this side dish. besides carrots being healthy and delcious, they also make a very nice presentation as a side dish. btw, I love beets too and could never understand why my kids move their vegetables to the side of the plate. I bet it does pair well with lamb! This would be a great choice to cozy up next to lamb. My cousin eats raw carrots, daily... and lots of them. Even though she is 50- she still has ber carrot colored hair. ha - isnt that funny. I thought you'd like to know that I made this for Sunday supper this evening and it was a big hit. My 83 year old parents loved it - definitely to be added to my 'keepers'. I look forward to trying these carrots Mary....we love them, but I'm in a rut as far as finding different ways to serve them. Thanks! Pondside, I'm delighted your parents enjoyed the carrots. It is a nice recipe. Thanks for the feedback. I adore carrots, one of my favorites. This sounds like a great addition to the Easter table. Mary, this look simple and healthy! Oh how I love carrots. I just pulled some from the garden and now I have the perfect recipe for them. I remember those days when my babies sported an orange glow! This recipe has my complete attention. Wonderful flavors! Cumin is one of my favorite seasonings. I think this dish would be perfect with lamb! Excellent! Saving this for the allergic to everything kid. She'll enjoy this one, as we will too. Thank you.